Has the inspector had formal training from a recognized training school? 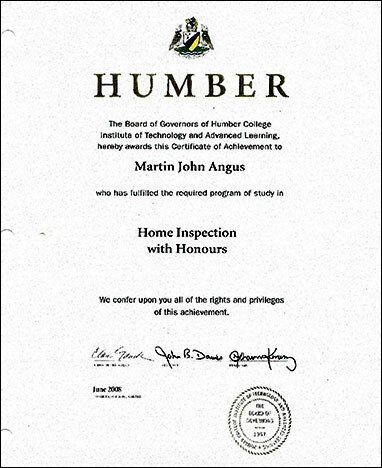 ANGUS Home Inspection - my training includes the Home Inspection Certificate (with honors) at Humber College. This certificate includes 9 courses, two of which are Ontario Building Code. In addition, membership in Internachi requires the ongoing and upgrading in training over time. This is can be a misleading qualification if the right questions are not asked. ANGUS Home Inspection - my background includes several extensive home renovations and restorations. I have personally done extensive wiring, structural carpentry, flooring, HVAC, concrete work as well as plumbing and masonry. My home inspection business is my full time occupation. Even well trained, experienced home inspectors must continually update their skills and knowledge. ANGUS Home Inspection is consistent with the requirements of InterNachi and OAHI, continuing education includes monthly seminars, specialty inspection upgrades etc. A minimum of ongoing continuing education is required. Home inspectors who have made the commitment of time, training, testing and money to belong to a reputable professional home inspection society are generally more committed to doing a high quality job for their clients. 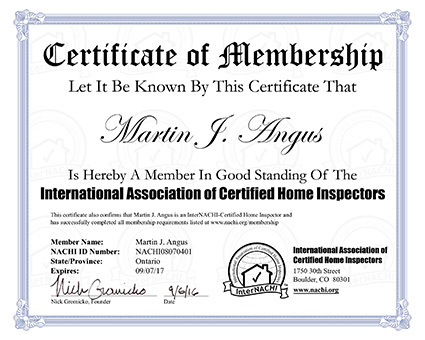 ANGUS Home Inspection current membership includes InterNachi certification. This is why you hire a home inspector, to provide written detailed information about the house. The first and most important question, when and how will you receive the report? On site, within 24 hours, a week, by email, regular mail or delivered by the inspector. What type of report does the inspector use, what is the approximate length of the report, are there pictures included? Be wary of short reports, 10 pages or less, and long report turnaround times. ANGUS Home Inspection reports include a comprehensive report with photographs. The report is provided on-site at the end of the inspection. The report includes details addressing all major sections of the inspection. In addition to the captioned printed images in the report, a CD is provided with all images in high resolution for later review on your computer. Will the home inspector be readily available for follow up questions? Is the inspector sensitive to your sometimes tight scheduling needs? ANGUS Home Inspection is available 24/7 for questions. Inspection schedules are very flexible and will follow your timing requirements as best permitted. Customer service and complete satisfaction is our goal. Note: It is inadvisable to do a home inspection after dusk as there are so many factors that can be missed in the dark. ANGUS Home Inspection competitive rates start from $250.00 upwards depending on type, size, age and location of building. Please contact Angus Home Inspection for a binding quote.